Beach relaxation and city exploration all rolled into one! It might sound like a fantasy holiday, but our Silver Coast villas place you around an hour from wonderful Lisbon and its thriving gay scene. You could be kicking back on silvery shore one day and exploring the Portuguese capital the next! This historic city welcomes the LGBT traveller with open arms. 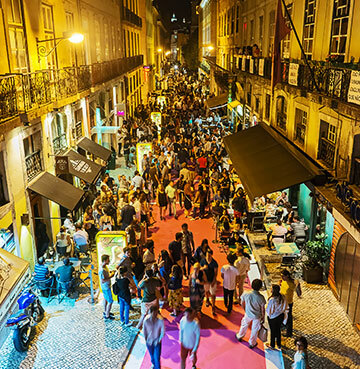 Whether you’d love to party at Pride, enjoy quirky nightlife in Bairro Alto or just take in some culture – this is gay friendly Lisbon. Príncipe Real is home to a truly eclectic mix of clubs and some of the finest LGBT nightlife spots in Lisbon. Trumps feels like the founding father, coming out of Lisbon’s closet in the 1980s and still going strong today! Open until 6am on Fridays and Saturdays, it shows no signs of slowing down. Foxtrot is a swanky bar that brings back the spirit of jazz, so grab a cocktail and appreciate the décor and music. Cinco Lounge has a reputation for daring to be different, so expect a few cocktail menu surprises between the margaritas and mojitos. It seems fitting to end with Lost in Esplanada, more colourful and quirky than most bars in Lisbon. A rainbow of chairs, umbrellas and art decorates this terrace, a kooky spot to sit and take in views of downtown. Lisbon’s quirky, fun and ultimately a little different – something it proudly puts on display when Pride rolls around. 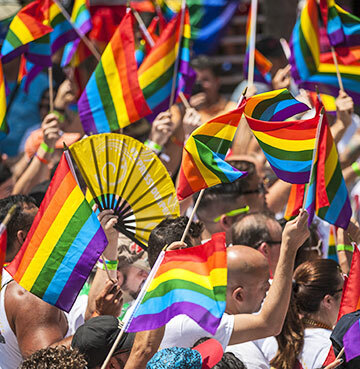 Many LGBT destinations wrap up their celebrations with a march through the streets - not Lisbon! Their festivities begin with a weekend of flag waving and feet stomping, as the LGBT community take to the city’s streets. Kicking off on the cobbles of Bairro Alto, the River Targus leads the crowds to the famous Praça do Comércio. Rest those weary feet and take in a little piece of Lisbon’s history while you’re here! This square was the commercial heart of the city and once home to a palace that succumbed to the shock of the Great Lisbon Earthquake in 1755. Why march together when we can dance together!? This seems to be Lisbon’s motto anyway. A week after the LGBT community whizz through the streets, Lisbon Gay Pride takes place and ends with a party lasting until four in the morning. Praça do Comércio becomes one huge dancefloor for the evening! Lit up by the disco lights of DJs, whose tunes echo around the square and spark even the most reluctant dancers into life. It’s not just one big party though! Earlier in the day you can get involved in family fun, crafts, community spirit and fill up at food stalls. The week between these events often sees club nights and exhibitions dedicated to the LGBT community, so it’s worth keeping your eyes peeled for more gay friendly fun. If you’re an adventurous soul and looking for plenty to discover, Lisbon is ideal! In fact, one of the world’s most famous explorers and expeditioners rests close to the city’s heart. Vasco de Gama spent his last night in Jeronimos Monastery, before setting off for unknown lands in the Far East! The intricate designs soon catch your eye as you stroll around, etched into pillars, arches and the magnificent spire. Belem Tower boast architectural delights of its own, with hints of Moorish and Venetian influence complementing its Manueline style. Once the chief protector of Lisbon’s harbour, this is an iconic monument and that sentiment is captured perfectly by its tower that’s still standing tall today. Although the honour for most impressive structure has to go to 25 de Abril Bridge. You could be forgiven for briefly believing that you’re in San Francisco, such is the resemblance to the striking Golden Gate Bridge. Renamed after the revolution of 1974, this is also a historic monument treasured by the natives. 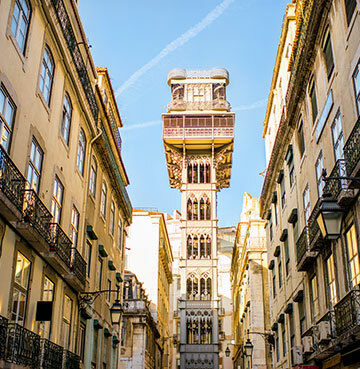 Lisbon is home to another monument that might give you that sense of architectural déjà vu. Travelling between the two levels of the city is the Santa Justa Lift, with a history and design that makes it more than just a lift! Envisioned by a former student of Gustave Eiffel, its Neo-Gothic style is bound to remind you of the famous French tower. When it first opened its doors in 1902 it was almost life changing for Lisbon natives, who now had a reliable and convenient means of travelling between the upper and lower levels of the city. On its first day of opening more than 3000 tickets were sold, highlighting the level of excitement that’s still enjoyed by tourists to this day. As the doors open at the top, a wonderful viewing platform greets you – it’s time to enjoy Lisbon from a new perspective.